Summer is finally here! With it comes the eagerly anticipated summer hatches. On many streams, the early morning trico hatches and spinner falls offer the best chance to fish to rising trout. The trico hatch is a sight to behold. Clouds of insects fill the air. The trico hatch shown below was filmed by fishing buddy Kevin on the Madison River. As the hatch progresses, a few trout generally begin to come to the surface, feeding on the duns. 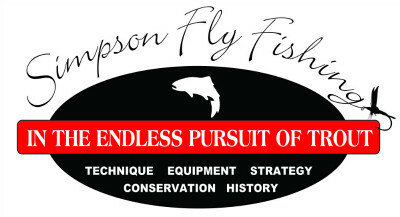 But unlike other mayflies, the adult trico life-cycle is completed rapidly, usually within an hour. They mate, egg-lay, then fall to the water’s surface as spent spinners. Trico spinner falls can blanket the water, as seen below. It is the spinner fall that draws trout to the surface in droves. But anyone who has fished a spinner fall has experienced the frustration of refusals. 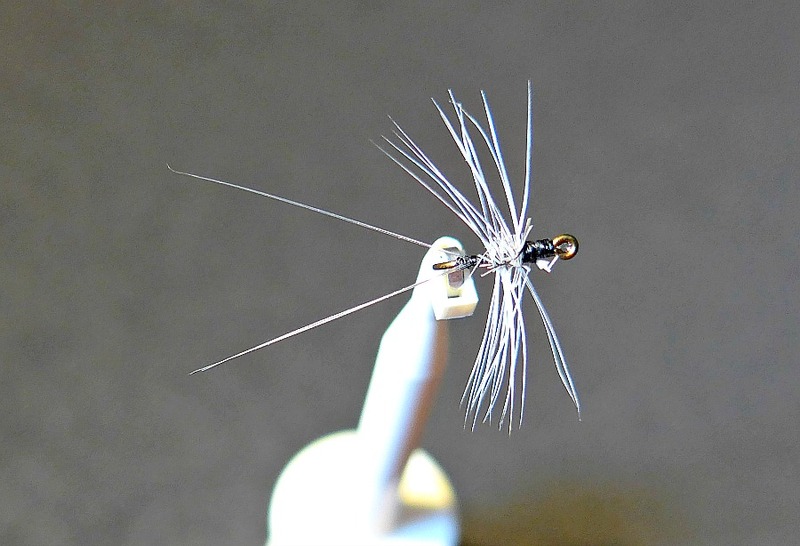 Male spinners, female spinners, and emergers, can all fail to draw the trout’s attention. Amidst the bountiful smorgasbord, we usually attribute this to the massive amount of naturals present on the water’s surface. Really, how could we expect a trout to even notice our meager offerings? Art Lee, in “Lore of Trout Fishing“, solved it by fishing egg patterns! Call me a snob, but I’m not quite ready to resort to that tactic. In my experience, there are often concurrent, easily unnoticed callibaetis hatches. Tricos and callibaetis are both mayflies, and inhabit similar water types. They prefer slow moving streams, especially those with some aquatic plants. Both have multiple broods over the summer, and on sunny days, they emerge mid-morning. Given their shared ecosystems, it shouldn’t come as a surprise that their hatches often overlap. Faced with refusals to proffered trico patterns, I look for the occasional callibaetis dun amongst the airborne tricos. They look like giant tricos. Tricos measure 3-6 mm, callibaetis 6-12 mm. Despite the overwhelming number of tricos, trout will often select the callibaetis instead. Perhaps it is the larger size, or perhaps they just taste better! When fishing a trico spinner fall, I generally start with a spinner pattern. 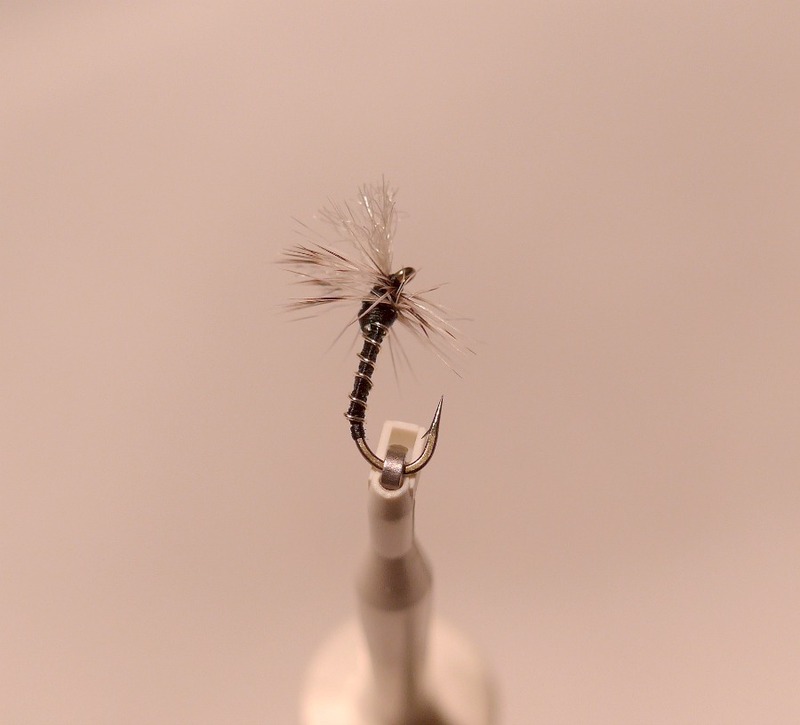 I prefer a pattern tied with trimmed, hackle wings. The shape is more realistic than Z-lon wings, with a broad base, and tapered tip. In addition, the barbules splay out, and look like the veins in the trico wings. They are difficult to see, so I typically tandem them with a parachute pattern. Sometimes the parachute is small, to imitate a trico spinner. But other times, it is a #14 parachute Adams, to imitate a callibaetis spinner. If neither tandem is working, I tie on a callibaetis emerger pattern, tied Quigley style. I tie this pattern in shades of gray and black, size #14. Amidst a trico spinner fall, the callibaetis imitations frequently get trout’s attention when the trico patterns are not! 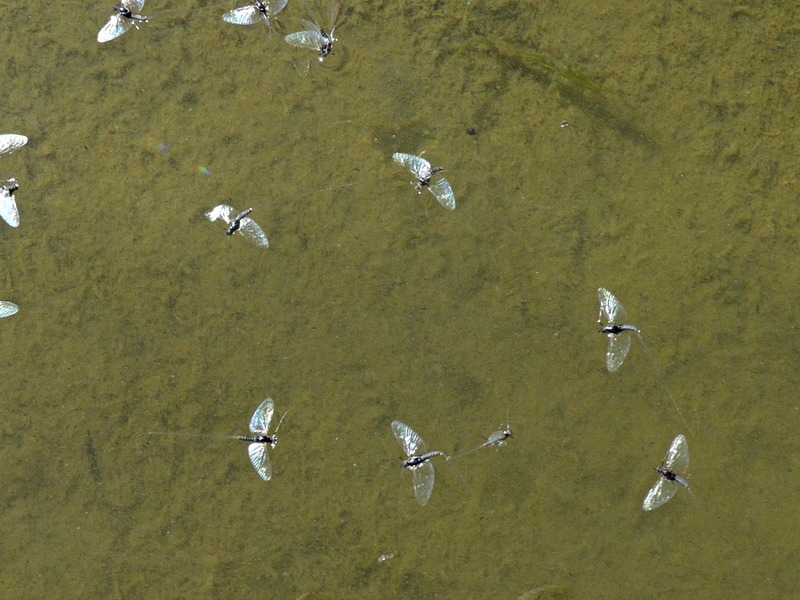 Trico hatches and the following spinner falls occur reliably all summer long on streams fortunate to have them as residents. If frustrated by refusals of trico spinner patterns, try callibaetis emerger or dun patterns. For me, this has often broken the code! written by Al Simpson, August 2018.